Confidently grow your real estate investing business from finding leads to closing deals. From Start to Paycheck! designed for New and Experienced Investors who need a complete system. 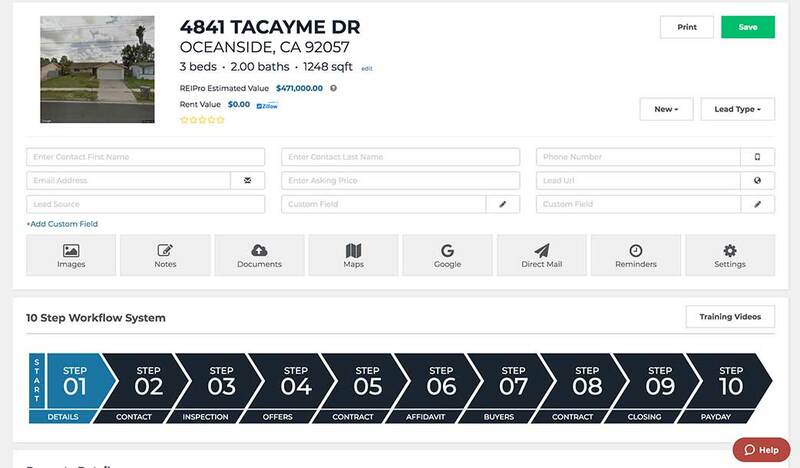 Manage your properties, contacts, buyers and marketing campaigns. Search over 150 Million Properties with a click of a button. Sold prices, Sold dates. All 50 states, updated daily. 10 year history. Build, filter, choose your marketing strategy and mail. Eye-catching postcard designs to helps you reach more sellers and buyers in less time, for less money, with less effort! DEALPro analyzes every deal from every angle, providing you with the valuable information you need to make wise investment decisions. Integrate REIPro with other business tools you already use. REIPro currently integrates with Google Calendar, Investor Carrot websites and more. Physical steps that must be done in a specific order to close a real estate deal. 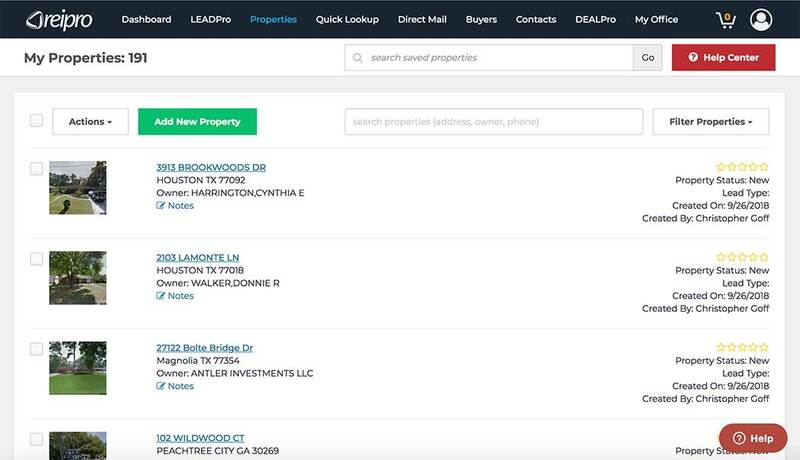 Quickly research properties for owner and tax info, mortgage amounts, transaction history, comps, and more. Integrated access to ROCKET LAWYER, right on your DASHBOARD. Advanced People Finder - locate owners faster with cell phone search capability. Comprehensive education geared to help you understand what you’re working with and how to make the most of it. Help is only a quick email, phone call, or online live chat away… your choice! Our support staff is available Monday thru Friday, 9am-5pmEST and happy to assist in any way they can. Run your comps with confidence! Create Custom Direct Mail Marketing Campaigns. 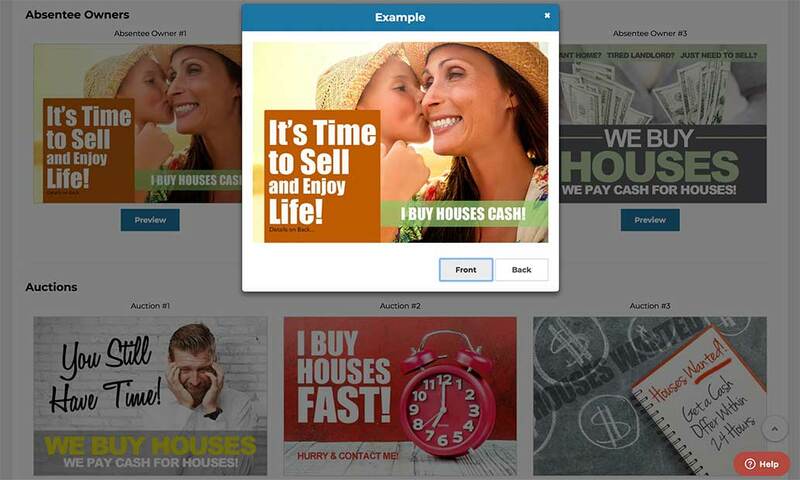 REIPro’s Direct Mail System is simplifying the way Real Estate Investors work their direct mail business. 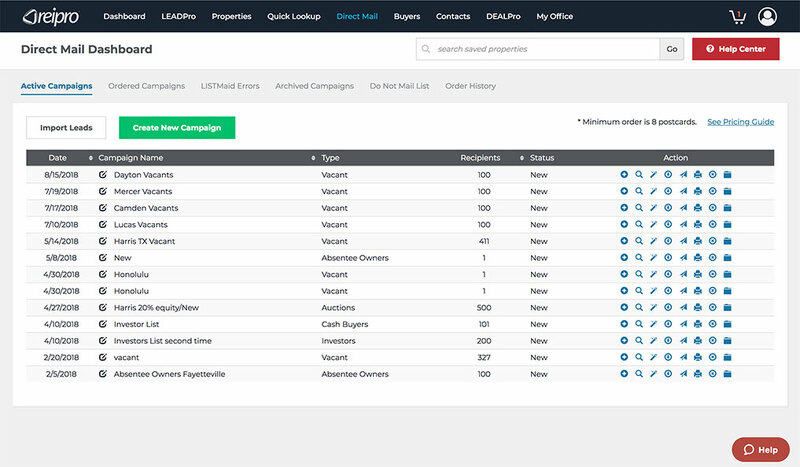 Build unlimited targeted campaigns, edit, export, archive, track and run our LISTMAID service that checks address errors and recent change of address. With our professional, eye-catching postcard designs and REIPro’s affordable, internal Direct Mail system, you’ll free up countless hours and be miles ahead of the competition. 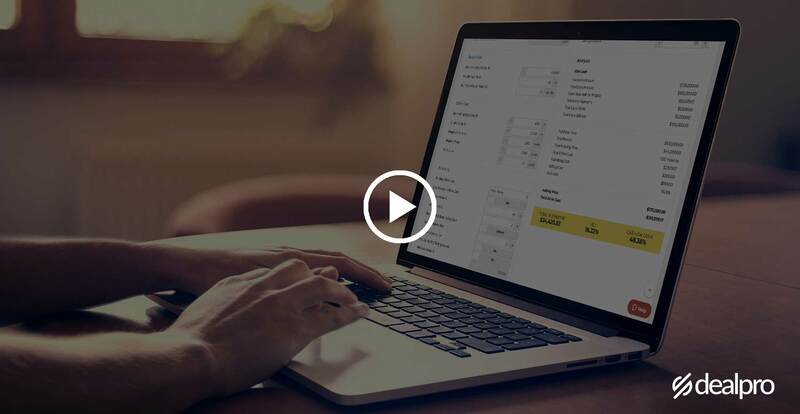 REIPro is the world’s first ever real estate investor software that walks you through the entire buying and selling process, step-by step, regardless of what real estate strategy you’re working. 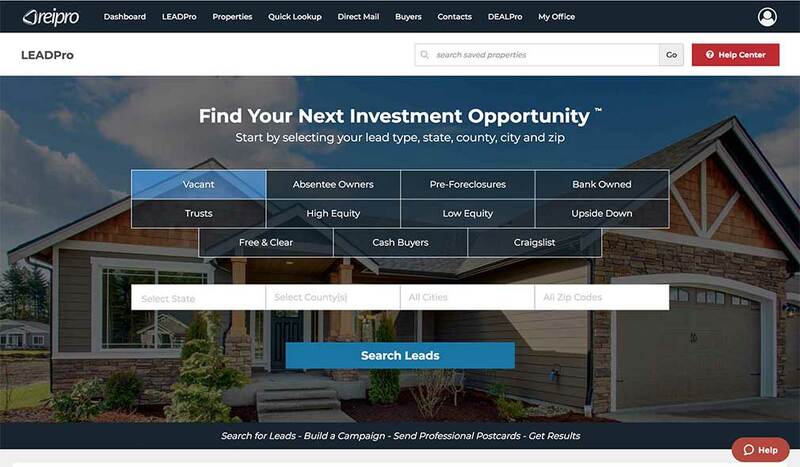 Quickly view any property, email any buyer and connect with any contact with a click of a button. REIPro is a Zapier integrated software, providing you with the capability to integrate with a staggering number of your favorite apps and automated workflow between them, creating more time for you to focus on the important stuff. Devoted to Helping You Succeed! REIPro's Core Values include excellent service standards - responding promptly to customer inquiries to maintain high customer satisfaction, providing UNMATCHED product quality by persistent, innovative updates, and maintaining Gold Standard Integrity in every aspect of our business. Our customers are the center of our universe and the reason why we do what we do. REIPro has been a catalyst for my company. It has taken my business organization to the next level. Not to mention, it saves me hours each day by using the many functions within the program itself. Previously, I did it the old fashioned way with paper, pen, and filing cabinets. It was such a relief when I started using this program. Less headaches, less clutter, and more time to spend on the important things...can't beat that. Shortly after I began Investing in Real Estate, I was given the opportunity to use the REIPro software in my business. I quickly found that not only did it make managing my business 10x easier, I found that many of the processes that are involved in Real Estate Investing are built into the software itself. I went into contract today with a more stable buyer that has a long term goal with the property, and I collected a cashiers check for $6,500. Thank you for helping me succeed in something that I did not even think was possible 3 months ago! 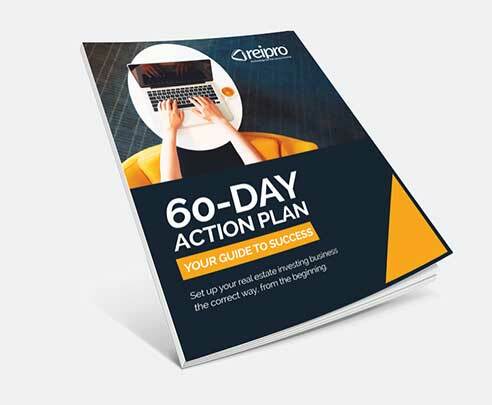 I completed my 1st wholesale deal yesterday and it would not have been possible or easy without following the 10-step system in REIPro. You guys make real estate investing possible for everyone. Each time I listen to a webinar or watch a YouTube video, I feel like Chris and Bo truly care about my success. We have closed on our first pre-foreclosure deal and made $20,000. Thank you so much for the guidance knowledge to put the pieces together. Chris…you are the man. Thank you so much for helping me close my first deal. It took some time but it happened and I look forward to the next one. I have an $11,000 check to prove it! REIPro every day to grow their business.